What is a good way to prevent students from writing an answer after you hand back a graded assignment (exam/homework) and claiming that you did not see their answer? It is clear to me that this particular student even used a different pen for their answer, and I am 100% sure that the answer was not there. I would have seen it, and I even remember double checking to see whether the answer was there. 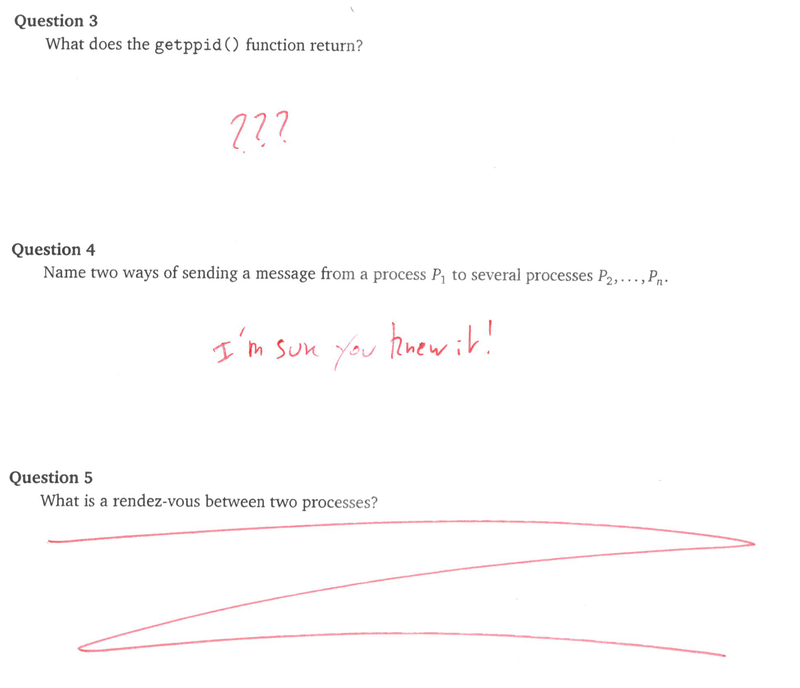 This is the second time this has happened to me in this semester (different students), and both times I am sure that they wrote the answer afterwards and are trying to gain more points. Don't try to catch the students that came back to you (supposedly) cheating, you just learned a lesson, and won't be caught again. I scan my student's assignments. There is a big printer with scanning function in our department where you can just put in the papers and it scans all of them at once. Moreover, I do warn them beforehand that I will scan the papers and check if one makes a complaint. This has the advantage that the students will not cheat (in this way) and saves me the time from finding the student's scan in a huge pdf file and comparing the two versions. Of course, to make scanning practical, you should tell the students not to staple their assignments (and only staple them afterwards), so as to be able to feed an entire pile of papers into the xerox. Consider using electronic submission for weekly assignments. I have had success with asking my students to submit scanned PDFs of their handwritten homework assignments, via my college's course-management website. (We use Moodle, but I assume that Blackboard & other equivalent software have similar functionality.) Assignments are then graded directly on the PDF and uploaded as "feedback files". Any change to the uploaded file is not allowed after the official due date, so it isn't possible for the student to add additional information after the graded assignment is returned. In some sense, this is similar to the method advocated by user82630 above, but with the tedious work of scanning offloaded to the students. This method might not be appropriate for a test, though, since it does require that the students be able to access the web to submit their assignment. Make a large red thick line through the empty space where the answer should have been. Do the same when students use only part of the space available. If a student adds/extends his answer afterwards, he/she would write over your line - proving that your line was there first, and thus, the answer was added afterwards. In my department we have the TAs use a paper cutter to slice off the corner with the staples (addressing the key bottleneck in scanning), then batch scan them into a single PDF using an auto-feed scanner. We then use Gradescope to separate the PDF pages back into individual tests, manage the marking process, and electronically return the tests. Gradescope (with which I am not affiliated) saves us enough time on the marking process to justify the scanning time, and as a side benefit we get a record of what was actually turned in. A random number of test papers will photocopied and kept in order to prevent cheating. Of course, just like warnings about security cameras or guard dogs, the notice provides the deterrent regardless of how many test papers are actually photocopied. I once asked him whether it was possible that the "random number" is zero, and I don't think he gave me a clear answer. Return a copy and hold on to the original (or vice versa, though holding on to the original prevents the student from accusing you of editing the copy). In my university professors often publish the solution right after the exam. Then, they establish a "review day" in which only one-two students at a time are allowed to enter the professor's office to see the corrected exams in front of him/her. In this way students can ask some questions but not allowed to leave with the orginal sheets. The clear drawback is the time consuming management of the "review day" but for sure you will not have that problem anymore and (from my personal point of view as student) students are more encouraged to ask questions about errors. I mark papers for several classes. Many are permitted an opportunity to correct minor mistakes. This allows a student whose mastery and knowledge are on the borderline between two grades, to demonstrate whether they are above or below that boundary. This is not an opportunity to edit and improve the submission by a significant margin, or to answer parts of the assignment/test/exam they avoidedd the first time through. Indicating the complete absence of a response in any page is done with a full diagonal line across the page, sometimes with a symbol personal to the marker, like a W or S or X or #. Indicating the end of an answer is done with a horizontal line immediately beneath the end of the answer, followed by the same diagonal line in the remaining space, if any exists. Where an answer takes up a small portion of the page, it may be boxed and the remaining space again slashed out. Diagrams, charts and key statements may be circled, then ticked right or marked wrong, to prevent later alterations and improvements in that particular area. Any text crossed out by the student is circled and annotated as such, to avoid claims of a marker having ignored it. Crossed-out responses that are correct and legible may be considered valid and marked like any other; this avoids the claim that the answer was legible and "someone else" changed it before marking. Finally, marked papers are kept under supervision at all times when the student is fixing the minor errors. Any paper leaving the controlled space is no longer available to resubmit. Some papers are kept secure and only a copy is given, and only when requested, and only with the intent of deciding whether to appeal a grade. Scanning is a good thing, but super tedious. For the class I TAd recently, we never given exams back to students. If you don't like your grade posted online, come to office hours and discuss the paper while I hold it in my hands. Some off-campus students get their work scanned, of course. One of the reasons we were not giving away work, is that in the past we saw students copy from senior students. On the front page, require the students to enter how many questions they have answered and how many pages they handed in. This answer is in support of user82630's answer that, "I scan my student's assignments. There is a big printer with scanning function in our department where you can just put in the papers and it scans all of them at once." I have also done this for several years. Previously there was some skepticism as to whether this was physically feasible or not, so I wanted to add some research data. Today I scanned the last cycle of tests in my courses this semester, and timed how long it took. I had 4 sections of math courses with a total of 69 tests; with answer sheets, this was 74 sheets (double-sided), for a total of 148 impressions. The scanning and processing on the bulk copier took 4 minutes and 21 seconds. This was done on a Canon ImageRunner Advance 6265, produced circa 2012, which has been the standard copier in all the offices at my community college for several years. I highly recommend this method for documenting tests. In addition to clarifying any questions afterward, there have been numerous times when I wanted to extract statistics from old tests that I couldn't have done otherwise. Publish the grades somewhere beforehand, e.g., online or on some message board (often this will have to be done anyways). Announce a time when the papers will be returned (e.g., at the end of a class). During that session, students can review their paper or check some detail of the grade with you but only while the paper has not left your supervision. Make sure that the students understand that once they leave your supervision with their paper, they accept their grade. If there's something they wish to contest, either it is resolved there and then while the paper has not left anybody's sight, or you take the paper to review or make copies of as needed. This is probably more suitable for exams since it requires setting aside some time to review papers, but is quite general (e.g., doesn't assume blank spaces that can be crossed out if the students use their own paper, doesn't require some sort of futuristic photocopier that your university could only dream of owning, etc.). Also in my experiences few students wish to contest grades and most just wander off with their papers; all grade contests have been resolved there and then in person. Also works well with TAs of course and they can escalate to you. Besides all the technical solutions mentioned above (that I do use), the marks in one question in one assignment aren't usually that significant on the overall grade; so, I usually let it go. But if I have the slightest suspicion that the student changed something, she/he will stay in my radar for the rest of the semester. Some of my professors have a policy of not reviewing exams after they have left their office. This requires that students come into office hours to pick exams up, but also allows for a conversation over the material before it is reviewed. Another option could be to ask students by their-selves to cross-out unused spaces on the answer sheet. This will make spaces crossed out by the same pen/ink that student was using, making the argument null that "teacher forgot to assess it (it as already crossed out by student)" as well as eliminating the option of overwriting that crossed space. This has been a practice in my country where invigilators present in the classroom makes sure that extra pages / spaces on the answer sheet has been crossed out by student himself. However if not done, original copies are never returned to students but are available for review upon request eliminating such claims. There are a few ways to be creative about your teaching and grading methods that might give you some cover and allow you to continue engaging your students in the learning process. If you have multiple sections / TAs, consider adopting a policy of team grading: each TA takes a single question or section and grades it across all classes, diminishing the chance that something is overlooked by any grader. It also helps manage the grade distribution across sections if that's a concern. Consider adopting policies that don't penalize cheating on specific or low-value assignments but would instead diminish the utility of cheating in general. For example, if a student fails the final exam, she fails the course no matter what grades she achieved prior to the exam. Cheating on a homework to improve your grade won't prepare you adequately for the final. For high-value assignments, one of the methods recommended in other comments may also help. Consider moving to low-value high-frequency in-class quizzes (in the U.S. we call them pop quizzes) that give you a good idea of how well your students understand the material you're teaching. Modify your material and methods as needed to ensure that they grasp the material effectively and review in the following class. Assign an overall course weight to the quizzes (e.g., 5-10%) that you have some freedom to distribute, like a participation grade, so that individual quizzes don't dramatically affect grades. Ensure that questions on the exams differentiate students adequately. This is difficult and could be a little controversial. For example, you might consider asking questions that require a good understanding of material but that were not exampled in class. I took an astronomy course where the professor asked us a completely novel question that we had never seen before; while we had all of the tools to solve it, it required some inventive thinking to answer. Generally a student isn't going to be able to talk his way through this--more likely he'll complain that the test isn't fair (but of course everyone took the same test). Information is not the same as knowledge; knowledge is not the same as understanding; understanding is not the same as wisdom. If you don't know what questions to ask, you don't understand the material. In my experience, grades are an assessment, at best, of knowledge. Reward students who can ask penetrating questions that go beyond the surface level of the material. It's exciting for students and teachers alike when the lights go on and they begin to understand and grow beyond the course content. This, more than anything, tends to diminish cheating. You can laminate assignments before returning them. That way, a student can no longer write on the laminated assignment. Theoretically, a student can open, add an answer and relaminate, but he or she would probably destroy the page in the process. What is a good way to prevent students from writing an answer after you hand back a graded assignment(exam/homework) and claiming that you did not see their answer? I think it helps to place the burden on the student for presenting a coherent, well-organized set of solutions to an assignment. solutions must be neat and easy to follow, etc. The key takeaway here is that students are responsible for putting their solutions into a format which is conducive to accurate grading. When I grade student submissions that are missing answers, I place a red X in the most logical place that one would expect to find an answer to let the student know why the credit points were not awarded; however, students who do not adhere to the above expectations on neatness and organization risk getting zero credit for either that particular problem or, in the case of a totally incomprehensible train wreck of a submission, zero credit for the entire assignment. Although rare, students who claim that I did not see their answer don't have a leg to stand on: I simply point to my syllabus and tell them that their solutions weren't organized well enough. That's it. End of discussion. TL;DR: You can scan student submissions until you are blue in the face, or you can take control of the classroom and let the students know that you aren't playing around. I leave it to the reader to decide which course of action is best suited to their needs. From the student’s perspective, this practice helps keep the playing field even. There are always students who manage to obtain previous versions of a professor’s exams, putting honest students at a disadvantage as far as knowing what to expect and what to study for. The reality is, if we hand back exams (either paper exams or electronic files), they will be handed on to other students. I believe all students deserve the same opportunity to learn and earn their grades. Is there any live option for tests to be given via website, perhaps via Moodle? I don't know that you personally are a computer programmer, but writing a test that students can answer via an (X)HTML TEXTAREA, could easily preserve original answers, plus any feedback / comments / grades you have. A good programmer using just CGI should be able to knock out something like this in scantly more than a day, if even that. You don't have to actually scan or photocopy their works. Just tell your students that because of the problems mentionned, from now on you will scan their work to be able to check them afterwards. No need to actually do it, they will stop trying to cheat that way (at least 99% of students would). In case somehow the problem still happens (unlikely), then be honest and tell them you were expecting that this announcement alone would be sufficient to stop this kind of issues, and then really start scanning them. This is a nonsensical, non-problem. If the student comes back and claims you didn't see the answer, you simply say "no, all unanswered questions are double-checked" and that is the end of it. There is no argument. The student is not a peer so does not have the option if discussing or arguing about it. If the teacher does not have authority over the class, then the teacher's personality is not suited for the profession. It is never the burden to persuade. Not the answer you're looking for? Browse other questions tagged ethics teaching professors undergraduate cheating or ask your own question.